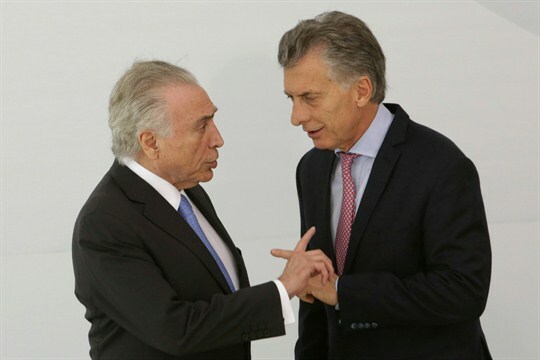 Brazilian President Michel Temer talks with Argentine President Mauricio Macri at the Mercosur and Associated States Summit of Heads of State, Brasilia, Brazil, Dec. 21, 2017 (AP photo by Eraldo Peres). Last week, negotiators from the European Union and Latin America’s Mercosur trading bloc, which includes Brazil, Argentina, Paraguay and Uruguay, concluded another round of unsuccessful talks in Brussels aimed at securing a free trade agreement. Negotiations between the two sides have been ongoing periodically for over two decades, and the most recent round again failed to provide a breakthrough, although talks will reconvene in Paraguay on Feb. 19. In an email interview, Sebastian Dullien, a senior policy fellow at the European Council on Foreign Relations and a professor of international economics at the applied sciences university HTW Berlin, discusses the recent push to finally seal a deal at a time of growing protectionism.